I have been playing a lot of Dota, watching a lot of Dota streams and I have also been observing the DreamLeague qualifiers after patch 7.21 dropped. 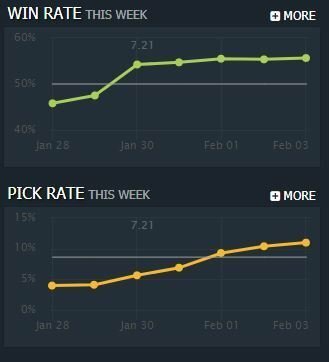 Surprisingly enough, most of the heroes that were strong in 7.20 are still strong in 7.21 and are very popular too. I guess that’s the difference between a re-balance patch and a gameplay update. A gameplay update like 7.20 completely changes the meta while a balance patch like 7.21 just spices it up a little. In this article, I will be sharing my opinion on the top heroes for every role in the current meta. Although Terrorblade received a minor nerf to his base strength and strength gain, this hero still seems to be one of the top picks of the meta currently. The specialty of Terrorblade among flash farming heroes is that Terrorblade can farm very rapidly while being fairly safe from the enemies at the same time. Sending out illusions to farm and push the lanes, while you safely farm the neutrals is just extremely convenient. This has always been a benefit of illusion heroes and Terrorblade happens to be the best illusion hero in the game currently. Troll is one of the most durable heroes for pos 1 role. His skill set provides him with almost everything a carry would want in lane. He can cause enemies to miss attacks with Whirling Axes and he can also swap from Range form to Melee form which is very handy against difficult dual lanes. Aside from being good in lane, he also has good late-game potential and pushing power. All these factors combined together make Troll a very strong meta pick. In the previous patch, Sven was played primarily as an offlaner and also a position 4 hero. In 7.21, support/offlane Sven got heavily nerfed due to the cooldown increase on Storm Hammer and the changes to Warcry which made it dependent on your Strength. However, carry Sven looks very strong right now, as the nerfs were focussed on Offlane and Support Sven. Warcry scaling with strength is good for carry Sven and he also does not really care about the nerfs to Storm Hammer as he maxes it last and focuses on farming. The movement speed buff is also extremely good for Sven as he is one of the most kitable heroes in Dota 2. Another hero who got +15 ms this patch. He also got a +2 base armor buff which is great for the hero. He is also a durable hero that can tank a lot of harass in the lane. Besides, the new phase boots seem like the perfect choice for N’aix – Armor, damage and movespeed is exactly for N’aix needs. He can start trading very efficiently once he has a completed phase boots in the lane. After reading the patch notes, there was two heroes that I was really terrified of facing in my pubs – IO and Ursa. Imagine facing them both together, they make a really good combo too. Ursa starts with a movement speed of 332 in 7.21. That’s as fast as a Pugna. Before this patch, Ursa was one of the most kitable heroes in Dota, and that was always his biggest problem. Now that its not a problem anymore, Ursa seems like a very scary hero right now. Although Fury Swipes got nerfed in the early levels, I’m quite sure that any Ursa player would be happy to trade the Fury Swipes nerf for the Movement Speed buff. Going for max Fury Swipes will definitely be the build now. 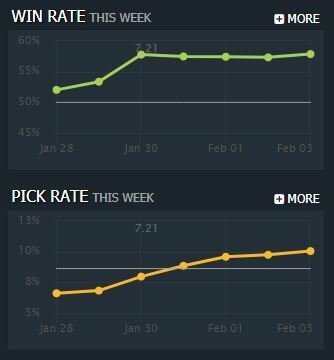 Win-rate and pick-rate of both Ursa and Lifestealer increased significantly after 7.21 which makes it very clear as to how powerful these heroes are right now since it is not so easy to kite them anymore. Razor is one of the best heroes to pick for winning a lane. He becomes an exceptional force if he is picked against counters like Tidehunter and Brewmaster. Although people are picking him mostly as a counter-pick right now, I have a feeling that he might become a meta pick once people start playing him more. This hero also farms really fast now due to having two AOE skills in Plasma Field and Unstable Current. People were already picking him a lot in 7.20 and he also received a few minor buffs in 7.21 which might make him even more desirable for players in this patch. One of the best mid heroes currently. Kunkka wins most mid match-ups because of Tidebringer. Tidebringer can be abused to get easy denies as the spell doesn’t go on cooldown if it used for a deny. He is also very tanky and has a lot of burst damage and catch. Kunkka only got a small change this patch. His level 25 talent, -1.5s Tidebringer Cooldown was replaced with +60% Tidebringer Cleave. Considering people are not even going for the 1 shot crit build anymore, this change doesn’t matter so much. People might opt to go for Ghostship Fleet talent more often now. Since Cleave damage is now affected by armor value as well, players are building items like Radiance, Heart, Heaven’s Halberd, BKB and so on, to elongate teamfights and kill high armor cores. One of the strongest mid-laners in 7.20. It baffles me that OD received such weak nerfs. He only lost 5 MS and Sanity’s Eclipse multiplier was reduced from 9/10/11 to 8/9/10. OD can still farm really fast and win his lane against most heroes, which means that his presence in the game is going to be the same as before. For the same reasons as I mentioned before, Razor is a really strong hero even in the mid-lane. He is especially good against melee heroes but he is still strong against slow MS Mid heroes like Invoker. If you don’t have last pick and you have to select a mid-hero, Razor is a really good choice as he will always do fine in lane. Timbersaw got some pretty decent nerfs in this patch. Reactive Armor got nerfed and Whirling Death also received a small nerf. However, Timbersaw is still good at what he does. He is good against illusion heroes like Terrorblade, and also against Strength cores like Magnus, Beastmaster and Tide, who are all popular picks right now. It is also very hard to kill a Timbersaw without a proper lineup, which makes him a very dangerous last pick hero. One of the best heroes for tower pushing and nuke damage. He is good against many popular heroes right now like OD, Terrorblade and Troll. 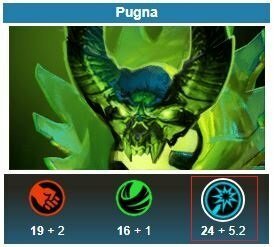 Since 7.21 increased the primary attribute growth values of all heroes by 15%, Currently, Pugna has the highest stat gain of all heroes at 24 + 5.2 Intelligence. His MS was reduced from 335 to 330 but that’s a very minor nerf. Batrider received some very nice buffs to Firefly in 7.21. The bonus movement speed of 4/7/10/13% is also going to be really handy since many heroes got movespeed buffs in 7.21. One of the best heroes in the game right now. Dazzle is extremely versatile, and can do almost everything in the game. He can be put in any lane, he can push towers with Necronomicon and Shadow Wave, he can harass endlessly with Poison Touch, he can win teamfights with Shallow Grave and the list goes on. Dazzle only got very minor nerfs and he will still be seen as one of the best heroes of the previous patch and this one. In this image, we can see that the patch barely made any difference to Dazzle’s win-rate or pick-rate. The hero boasts a spectacular 53.86% win-rate and 12.46% pick-rate currently. NP is the best hero to pick if you want to stomp your lane. Treants are just way too strong to handle in the early game and Prophet also has a free TP with his Telportation skill. The main problem with playing Prophet was always the mid and late-game. The hero falls off heavily if he does not go for the perfect item build or if he dies once or twice. Since NP got the +25% cooldown reduction talent at level 20 now, the Aghanim’s Scepter and Octarine Core build seems viable. Wrath of Nature’s cooldown gets lowered to 33.75 seconds with the talent and Octarine Core. This means you can push every wave simultaneously in all 3 lanes. That makes it extremely difficult for the opponents to push into your base. Tusk and Earth Spirit were the most contested position 4 heroes in the previous patch. Surprisingly, both the heroes didn’t get nerfed enough for them to be bad. Both the heroes received very similar nerfs. Tusk’s Tag Team got nerfed in the early levels and Earth Spirit’s Rolling Boulder also got nerfed in the early levels. These heroes don’t mind these nerfs too much since they max the skills early anyway. The biggest surprise of the patch was that IO got heavily buffed. Considering that he was the most banned hero at The Chongqing Major, most people were expecting that IO would be nerfed instead. Tether now heals even when IO is at max hp/mp, and Overcharge also received massive buffs. On top of all that, Relocate now has cast delay instead of channel duration again. 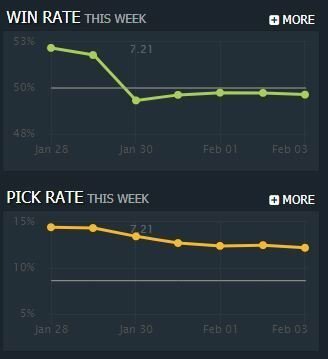 After the patch, IO’s win-rate shot up to 53.14% in the 5k MMR and above bracket. Players are spamming IO in pubs right now, to make as much MMR as possible before he gets nerfed. If you are IO player, this is your time to shine as he will definitely be nerfed soon. 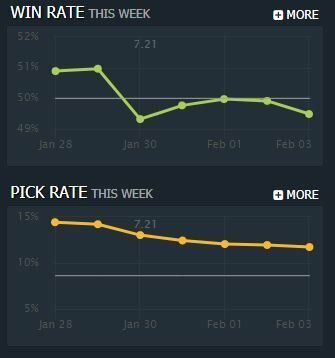 Previously an Offlane hero, Tiny is now very popular as a position 4 hero. 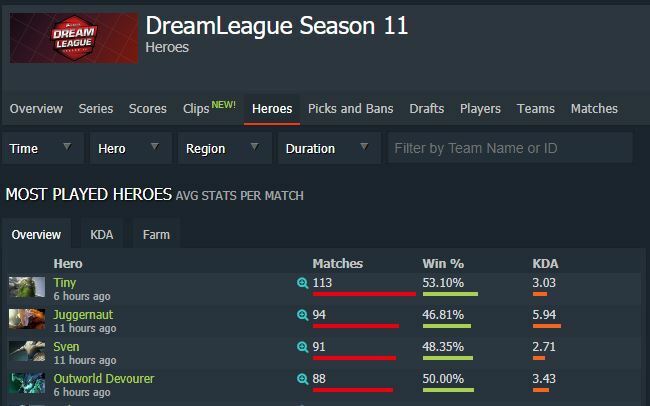 He is currently the most picked hero in the DreamLeague open qualifiers with 113 games and has a solid win-rate of 53%. This is for a good reason. Tiny is an extremely versatile hero just like Dazzle. He can be played in any role except position 5. He was previously a common pick for the middle lane too and he is still played sometimes as position 3. Tree Grab is very good to get free denies in lane it is also good for harassing. Toss is a very dangerous spell as it can be used to easily dislocate enemies. Also, Tiny’s Nuke damage is very high which makes him good against squishy supports. Considering how good he is and how tiny his nerfs were in 7.21, no wonder he is one of the best heroes in the game right now. Both Lich and Grimstroke were the most contested position 5 heroes in the previous patch, just like Earth Spirit and Tusk for position 4. Both the heroes got heavily nerfed but surprisingly, these heroes haven’t lost their popularity. Lich is extremely good throughout the game due to Frost Armor. Frost Armor makes it really difficult for enemies to initiate onto your team as it is very hard to focus a hero with Frost Armor on. 60% Physical damage resistance is nothing to scoff at. Sinister Gaze is also a very good spell and it functions almost like Pudge’s Hook in a sense. Grimstroke also received a lot of nerfs which will hurt his laning phase a lot. But still, his ult is exactly the same which means that the hero is still very good at what he does. 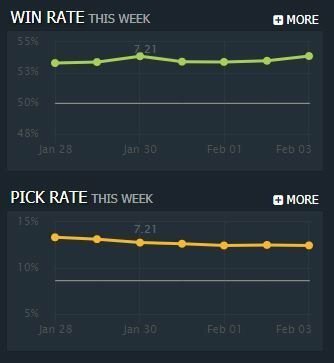 Win-rates of both the heroes plummeted after 7.21 due to the nerfs, and the pick-rates have also gone down. 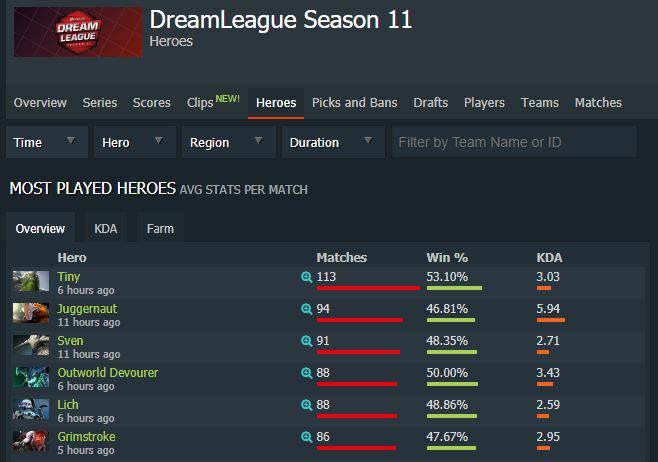 But they are still the most picked position 5 heroes in the DreamLeague Open qualifiers. We will have to wait and see if players will find new and better position 5 heroes to replace these two. Reduced Soul Catcher mana cost from 110 to 50/70/90/110. Reduced Shadow Poison mana cost from 50 to 35/40/45/50. Basically, Shadow Demon’s early-game has been heavily buffed due to the mana cost reduction on Soul Catcher and Shadow Poison. Shadow Demon’s main problem was the laning phase. He was previously weak in the laning phase but a very strong force in the mid-late game due to Disruption and Demonic Purge. I guess the buffs were strong enough to fix his laning phase since I have been seeing a lot of Shadow Demon players in my pubs. The hero seems quite strong, especially when he paired with high agility heroes like Terrorblade and Luna.